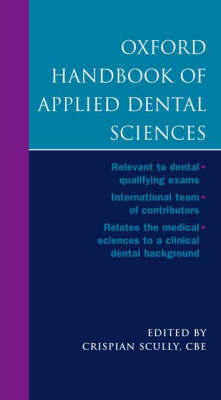 The Oxford Handbook of Applied Dental Sciences covers the medical sciences for the preclinical dental student in a concise and easily accessible format. An international team of experts in dental education and research provide information on the applied basic sciences to ensure a sound understanding of why the medical sciences are relevant to clinical dental practice. Anatomy and development, pain and behavioural sciences, biochemistry, genomics, immunology, microbiology, pathology, and physiology are all covered. Emphasis is placed on advances in the sciences, the changed content of subjects, and the relevance to dental clinical practice, ensuring that this Handbook will provide all the information necessary for a comprehensive understanding of the subject.